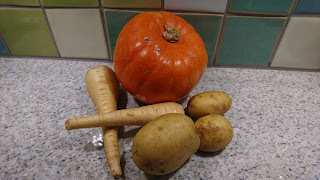 As my way of celebrating Halloween I was serving pumpkin soup yesterday evening using the recipe on Føtex græskarsuppe. I made no changes to the recipe. It is a good recipe, however the use of the roasted pumpkin seeds did not bring anything special to me. It was actually pretty distracting to chewing these pumpkin seeds, so after a few seeds I got ride of the remaining pumpkin seeds !!! I am wondering, if exchanging the coconut cream with mascarpone would bring some more body to the soup. Also the spice level is very moderate, so it is not harming anyone. Fry the onion and garlic in the olive oil in a cooking pot for 2 minutes. Add in the parsnips and potato, and fry for another 3-4 minutes. Add in the various spices and them fry for 1-2 minutes. Add in the pumpkin, vegetable stock and coconut cream, and let the soup simmer gently for 20 minutes. Meanwhile mix the rye bread crumbs, olive oil and salt together. Roast the rye bread crumbs in the oven (fan) at 175'C for 15-20 minutes. Roast the pumpkin seeds on a dry pan for 5 minutes. 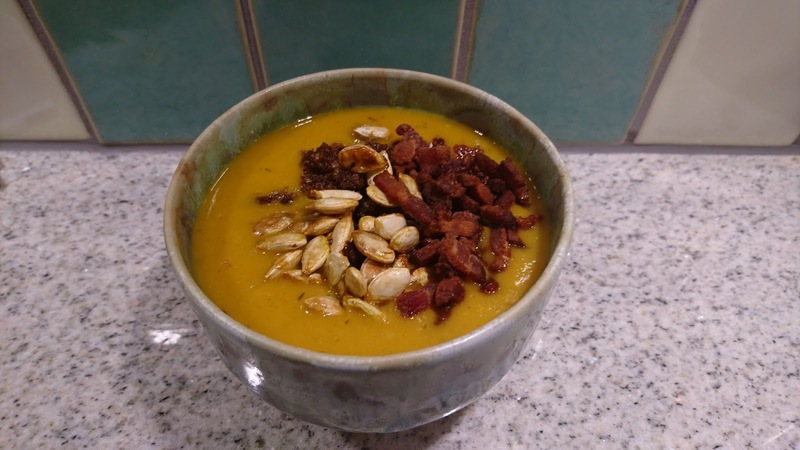 Serve the soup with toppings in form of roasted rye bread crumbs, pumpkin seeds and bacon.